The 8-night Spring Costa Rica Caribbean Experience offers a diverse adventure that combines the Caribbean Highlands of Costa Rica – with its breathtaking tropical beaches. It begins by sampling some of the color that San Jose, the nation’s vibrant capital has to offer; continues with a whitewater rafting run down to the Caribbean Lowlands, with their tropical beaches, unique flora and fauna, active nightlife, and indigenous culture; continues with a visit to Tortuguero National Park, with its majestic jungle canals and the late-night ritual of endangered turtle nesting on its beach; and it ends in the highlands, with their lush mountainous rainforest, waterfalls, freshwater pools and serenity - spending the time based at a cool eco-farm on the slopes of Volcan Turrialba. Two nights on an eco-farm, home to untouched rainforest and amazing waterfalls! Explore Tortuguero National Park, its natural canals and its wildlife of turtles, crocodiles, monkeys and more - with an optional turtle nesting tour! Caribbean beaches, and more Caribbean beaches! 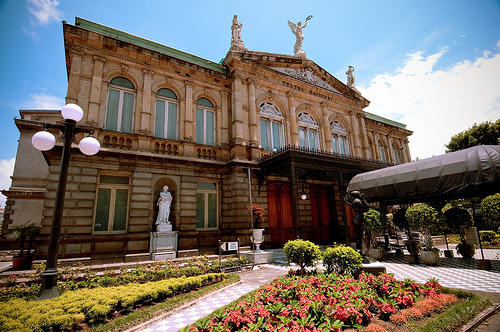 Explore Downtown San Jose - while getting to meet your group-mates for the week; see Plaza De La Cultura, the National Theater. It is Saturday night, and if you are up to it, you can check out the Latino vibe of the local nightlife. After dinner, enjoy live Reggae music with moijtos, daiquiris or fresh Pina Colada! Afternoon : we will visit the Indigenous BriBri Tribal Area and learn about the history of the native people of Costa Rica, medicinal plants, as well as the history and production of chocolate – including tasting! Late afternoon: enjoy a sunset swim along the magnificent Punta Uva beach, thought by many as the most beautiful beach in Costa Rica! Later, we will participate in a Caribbean cooking lesson: using fruits and veggies typical to Coastal Talamanca, you’ll learn to cook in the traditional Caribbean way from some of the local matriarchs - and enjoy a great meal afterwords. Morning: an amazing Jungle Canopy Tour, where we will literally fly through the forest by zipline. After lunch, we take a ride up the coast to the port of Limon, where we take a boat ride up the inner coastal canal, bringing us to the tiny island village of Tortuguero Tortuguero, and the nearby national park. Check into to the jungle Evergreen Lodge – free evening in hotel. 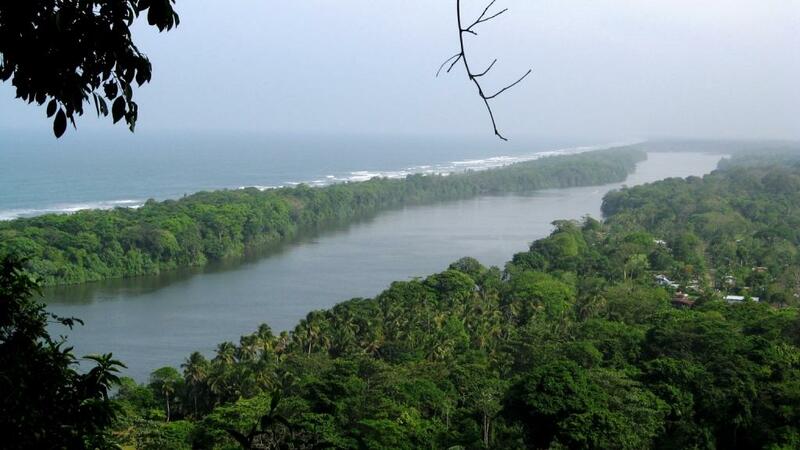 Early morning: Join a canal boat tour of Tortuguero National Park- experience the awakening jungle up close! After breakfast, hike Tortuguero Hill, the highest point on the Caribbean side of the country (approximately 119 meters), and learn about the unique flora of the jungle from an experience naturalist. On a clear day a view of Tortuguero and the surrounding areas can rally capture you! Afternoon visit the local village - a chance to interact, shop, and experience this secluded Tico community. During this time you can also head to the beach and enjoy the Caribbean sands at sunset! Late night (option): take a night tour to see the female green or Leatherback turtles, which come during this season to lay their eggs on the picturesque coast. As this is early in the season, the tour will depend on turtle sightings. Horseback ride , followed by macadamia picking, fresh sugarcane tasting, a view of the big waterfall (over 100 ft! 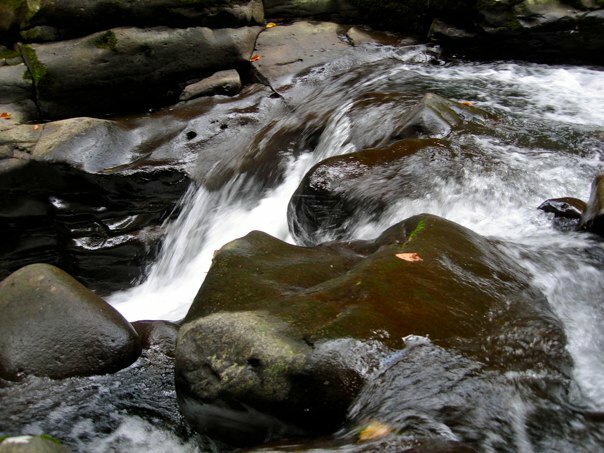 ), and a hike to another waterfall where we will take a swim in the cool water and enjoy the rainforest around us. After dinner: Social activity and games - or just feel the serenity while lounging on the hammocks! Wake up early and to milk the dairy cows and goats – we will use the milk to make cheese later! Using machetes, clear brush and pick nuts at the macadamia grove. Afternoon: hike to the small waterfalls or explore the larger, more remote ones. Night: Option of going into town to enjoy a local Tico bar – our last night in Costa Rica! Time to say goodbye! We will leave Finca Rio Perla by 7:30 am, in time to make our flights back home. The Caribbean Experience trip will take place from Saturday, April 21st to Sunday, April 29th, 2012 (8 nights in total). We will be meeting at and leaving the San Jose (the capital) international airport (SJO). We ask that you plan to be on a flight that will land in San Jose by 4 pm on April 21st Your flight home should be no earlier than noon on Sunday, April 29th. In San Jose, you will stay in a comfortable hotel in the downtown area, such as the Costa Rica Guesthouse. On the Finca Rio Perla farm, guests will stay in rustic but comfortable rooms, with shared bathrooms and toilets. The cost per person is $1450. The trip will leave with a minimum of 8 participants and a maximum of 16. If this number is not reached by March 15, we will cancel and postpone the trip, and you will be fully reimbursed. If you cancel your attendance after March 15, we will reimburse you the sum of $1300, with $150 kept as cancellation fee. 150$ holds your spot for the amazing April 21-29, 2012 trip. To participate you must cover the full balance by March 15, 2012. 1450$ reserves your spot on the April 21-29, 2012 trip. 1300$ is the amount that must be payed by March 15, 2012 if you have already made the $150 deposit. If you have a discount code, you will be asked to provide it before submitting a payment via Google Checkout. 8 nights of accommodations on the Finca Rio Perla farm, in San Jose, in Hotel Monte Real in Arenal, and in a hotel in Puerto Viejo. Price is for accommodations of 2 per room. Single occupancy rooms are available for an additional nightly fee. 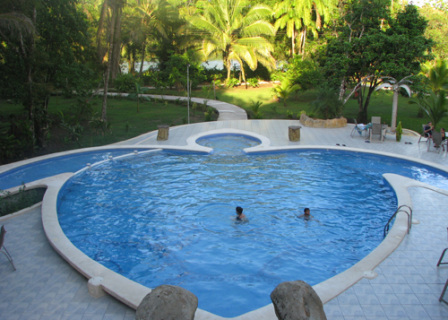 All activities and all meals during our 2 nights at the Finca Rio-Perla eco-farm. Meals included in trip: 8 breakfasts, 3 lunches and 6 dinners! Our tours are organized by the Costa Rica Caribbean Experience, a destination of Greener Travel Company, LLC. The company was founded by Ami Greener, an experienced and enthusiastic environmentalist that has been captivated by the unique beauty of Costa Rica. By forming personal relationships with local providers in Costa Rica (hotel owners, activity outfitters and the staff of Finca Rio-Perla, the amazing farm that we visit), we are able to offer a tailored experience to both individuals and couples traveling alone and looking to explore the area, as well as group tours which a member of our staff or local Costa Rican associates will guide.